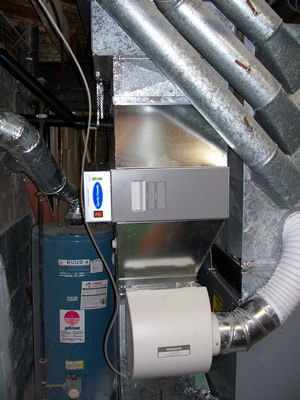 The filter that is supplied with the standard residential furnace is there to protect the furnace. The furnace should never be run without a filter. Without air filtration, dust and lint will build up on the furnace’s heat exchanger, blower housing and motor, causing reduced efficiency, equipment damage, and possible fire. If the furnace is equipped with an air conditioning coil, dirt accumulation on the coil will reduce air flow and cooling efficiency. 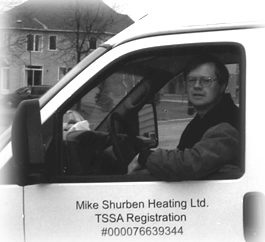 The furnace filter is not designed to provide fine particulate whole house air filtration. No filter can make polluted air clean. By polluted, we mean air containing; volatile organic compounds (VOCs), mold spores, viruses and bacteria, excess carbon dioxide (habitant byproducts), and even air that may contain the highly poisonous carbon monoxide (cigarette smoke, burning candles, poorly vented combustion appliances). Also known as mechanical filters, these are the simplest form of air filtration. A media such as woven fiberglass is situated in the air stream where particles collide with the media and get trapped. Some of these filters contain a sticky oil to help trap smaller particles. Most are disposable while some are washable. They are available in various filter efficiencies; low, medium, & high. The higher the efficiency at trapping particulate, the more restriction they provide to the airstream. This can lead to poor furnace efficiency. These are media type filters that are made from a material that generates a static charge when air passes through it. This static charge then attracts particles to the media providing more filtration than standard media filters. Most electrostatic filters are washable and reusable. Pre-Filter; filters out the larger lint type particles. The pre-filter also helps provide an even air distribution to the rest of the unit. This is important to help minimize ozone production. Charging Section; this is an array of small wire filaments or ionizer wires. The wires are supplied with a high DC voltage. The wires are suspended between grounded plates. The high voltage on the wires creates an electrostatic field causing any particle in the air stream passing through the field to pick up a charge. Collecting Section; the collector cell consists of a series of parallel plates. Half the plates are alternately charged, every other plate is at ground potential. As charged particles try to pass through the collector, they are attracted to the plates and trapped. Power Pack or Voltage Section; the power pack uses a step up transformer to take the 120 VAC to about 3500 VAC for powering the collector cells. The 3500 VAC is then passed through a rectifying doubler circuit to provide about 8000 volts DC to the charging section. Knowing the facts about house hold humidity will help you maintain the optimum humidity levels for both occupant comfort and a healthy building structure. For the straight facts about humidity see the CMHC Web site. As the name implies, this type of humidifier uses a rotating drum covered with a sponge like material (known as an evaporator pad) that is partially immersed in water. Warm air from the supply side of the furnace is blown in through the drum, evaporating some of the water from the pad. This warm moist air is them sucked into the return air plenum where it mixes with cooler air, gets heated as it passes the furnaces heat exchanger and is then distributed around the house. The major advantage of this type of humidifier is that there is no wasted water. All the water that enters the unit is used to humidify the air. Unfortunately there are a few drawbacks with this system. One of the main drawbacks is the fact that there is always standing water sitting in the reservoir. This provides a growing medium for molds and bacteria (humidifier fever). When the water evaporates, minerals in the water are left behind causing the evaporator pad to get clogged up and loose its effectiveness at evaporating the water. While the CMHC Web site suggests cleaning 3 times a season, this may not be often enough to keep molds and bacteria in check. Therefore these humidifiers are considered high maintenance. With this type of humidifier, water is allowed to flow across the evaporator pad and trickle down to the bottom of the pad where any excess water goes down the drain. The evaporation occurs in the same fashion as the drum type humidifier except the evaporator pad is not moving. The water flow is controlled by a solenoid valve that only allows the water to flow when there is a call for heat and a call for humidity. As excess water goes down the drain it carries with it the minerals left behind from the evaporated water, thus greatly reducing any mineral buildup. When the heating cycle is completed the water flow stops and all excess water flows down the drain, leaving very little in the way of standing water. Due to this flushing action the potential for mold and bacteria growth are greatly reduced. These humidifiers are virtually maintenance free requiring a periodic (1 to 3 years) evaporator pad change only. The majority of older homes are considered quite leaky for air infiltration (air entering the house) and exfiltration (air escaping from the housee). They are considered to be naturally ventilated. But the weather conditions affect the amount of air exchange. During the winter when the outside temperatures are a lot lower than the indoor temperature a stack effect occurs that keeps the leaky home potentially over ventilated. The stack effect is a result of the colder and thus more dense air entering the house through cracks and openings at the lower levels. The warm house air is lighter and rises in the house leaving the home through cracks and openings at a higher level. This is basically a chimney (or stack) effect. The colder it is outside the more air infiltration and exfiltration through the house. In the summer the temperature differences are very small. There is virtually no stack effect to cause natural ventilation to occur. But we have winds that provide ventilation by pressurizing the windward side of the home while depressurizing the leeward side. This creates a ventilation effect across the home. What about those calm hot days in the summer, when the air conditioning is on and there is no air movement outside? The main ventilation effect now is from opening and closing the doors to the home. Since the early 80’s, homes have been getting more air-tight and natural ventilation may no longer be adequate to keep household pollutants from building up. One of the indicators of poor indoor air quality (IAQ) is high humidity levels within the home. In the winter, this high humidity forms condensation and ice buildup on windows. In some cases this can be controlled by running a bathroom fan (90 - 110 CFM squirrel cage type) continuously while also circulating the house air (running the furnace blower continuously). This is referred to as exhaust only ventilation and is allowed by the building code as a viable form of providing ventilation to the home. The disadvantages of the exhaust only system are the noisy fan and the lack of any heat reclaiming from the exhaust air. A solution to the noisy fan and the lack of any heat reclaiming in an exhaust only system is to use a heat recovery ventilator (HRV). 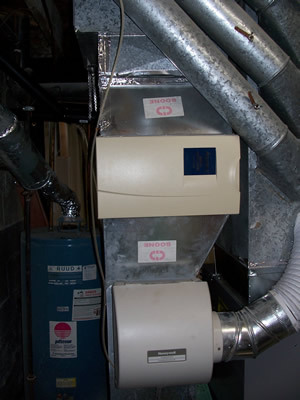 An HRV is located near the furnace and has separate intake and exhaust air ducts piped to the outside. As stale exhaust air leaves the house through the unit, fresh outside air enters the unit and a heat transfer occurs between the two air streams. This type of ventilation system is called balanced because the intake air and exhaust air are setup to provide the same air volume. The HRV is also designed to run quietly. There is usually two speeds of operation allowing for two levels of ventilation. Normally the low speed is sufficient most of the time but if conditions require more ventilation the higher speed can be used as required. As every house has different amounts of air leakage, the control of a ventilation system requires home owner awareness. For example, over ventilation can cause very dry air in the winter resulting in higher than needed fuel bills and uncomfortable living conditions. If the HRV is not maintained, then the filters will get clogged up and the ventilation capability will degrade.